Thermal magnetic circuit breakers ragefrom 0.1-220 Amps. High Breaking capacity up to 100 kA. Conformity to International Standards -UL, CSA, CE. S-shaped busbar for side-by-sideconnection with 40 - 65A Contactor. 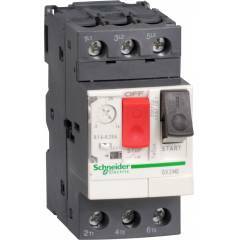 Schneider TeSys Motor Circuit Breaker GV2-M (100kA)-GV2ME05 is a premium quality Motor Circuit Breakers from Schneider. Moglix is a well-known ecommerce platform for qualitative range of Motor Circuit Breakers. All Schneider TeSys Motor Circuit Breaker GV2-M (100kA)-GV2ME05 are manufactured by using quality assured material and advanced techniques, which make them up to the standard in this highly challenging field. The materials utilized to manufacture Schneider TeSys Motor Circuit Breaker GV2-M (100kA)-GV2ME05, are sourced from the most reliable and official Motor Circuit Breakers vendors, chosen after performing detailed market surveys. Thus, Schneider products are widely acknowledged in the market for their high quality. We are dedicatedly involved in providing an excellent quality array of Schneider Motor Circuit Breakers.